Jeffrey Leonard Jarrett (born July 14, 1967) is an American professional wrestler, professional wrestling promoter and businessman. Beginning his career in 1986, Jarrett first came to prominence upon debuting in the World Wrestling Federation (WWF, now WWE) in 1992. Over the next nine years, he alternated between the WWF and its main competitor, World Championship Wrestling (WCW). After WCW was purchased by the WWF in 2001, Jarrett joined the upstart World Wrestling All-Stars promotion. In 2002, Jarrett and his father co-founded NWA:TNA (now known as Impact Wrestling). 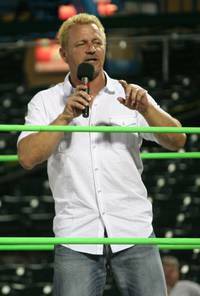 After departing the promotion in 2014, Jarrett founded a new promotion, Global Force Wrestling. This webpage uses material from the Wikipedia article "Jeff_Jarrett" and is licensed under the GNU Free Documentation License. Reality TV World is not responsible for any errors or omissions the Wikipedia article may contain.